Ms TN is not normally in the business of doling out writing tips, of which there is a sufficient plenitude online: but here's one. If ever you want to get some work done, book yourself into a hotel in a strange city for a week. The lack of procrastinatory devices such as washing dishes, polishing the bathroom taps, answering the telephone or castigating children has a startling effect. Everyone says that the internet is the problem, but I find that the internet runs out fast when there is nothing else to leaven it with. Aside from seeing theatre, since I arrived in Perth last weekend I've done almost nothing but write, as I have a couple of pressing deadlines which I brought across the continent with me. This meant that yesterday - which was scheduled for writing reviews - I hit that mysterious but frustrating wall which forbids the construction of a single thought, let alone a paragraph. On such days it is best to bow to the gods, and hope for better things. Meanwhile, the shows are piling up. So before I discuss my midweek adventures, let me highly recommend Trust, a collaboration between playwright/director Falk Richter and choreographer Anouk van Dijk from the Schaubühne Berlin that opened last night. It's a must-see for anyone interested in the possibilities of dance theatre. On Tuesday night I saw David Milroy's music theatre work Waltzing the Wilarra, which is given a luscious production by Wesley Enoch for Yirra Yaakin Theatre Company. Drawing on Australian traditions of cabaret and vaudeville, it's a swift-moving evening of knockabout melodrama with a political message. Its easy slippages from highly poetic language to vulgar comedy and its heightened theatricality recalls no one so much as the Wheatbelt poet and playwright Dorothy Hewett (whose play The Man from Mukinupin Enoch directed in a superb 2009 revival for Belvoir St and the MTC). The play opens and closes with a scene of stunning theatrical lyricism - Old Charlie (Trevor Jamieson), softly lit in the darkness, recalls a transcendent moment of initiation during his boyhood. He walks into a pool until he is up to his chest in water on a night that "was so still, the stars floated on the water...I couldn't tell where the night sky ended and the pool began". This moment of union and innocence sets the keynote for a possibility that is lost and betrayed in the action of the play. The chief theme here is reconciliation: whether it's possible and, more searchingly, what it might be. The action is set in a post-war dance club in Perth run by black MC Mr Mack (Kelton Pell) where white and black can socialise, despite repressive laws that ban Aborigines from entering Perth and threaten immediate arrest if they are found drinking alcohol. What's important in this play is that there are intricate (if troubled) familial relationships between all the characters, white and black. The local star is the singer Elsa (Ursula Yovich). She is married to a white ex-soldier, Jack (Tim Solly), who is suffering a severe form of what is now called PTSD. It has transformed him into a sick and violent man, who in his clearer moments knows that he will eventually kill his wife. Elsa is a stolen child, brought up in a mission; her mother, Mrs Cray (Irma Woods) is "nanny" to the white girl Fay (Alexandra Jones), whom Elsa resentfully feels has taken her place in her mother's heart, while Mrs Cray is the Australian equivalent of a household slave. Jack's adopted brother is Charlie (Trevor Jamieson), who is also in love with Elsa, while Fay has a consuming, hopeless and predatory crush on Charlie. The ensuing melodrama of jealous passion is played out in song and scenes of naturalistic drama, all of which is framed with vaudevillean patter from Old Toss (Ernie Dingo) and his offsider Young Harry (Jessica Clarke). In the second act, the action is brought forward to a degraded present, with the former dance hall now condemned. Here the well-meaning activist Athena (Jessica Clarke) organises a reunion of the estranged group, prompting unquiet ghosts to rise out of the past. This is much weaker than the first act: with the removal of Jack, we are left with white characters who are little more than wooden stereotypes, parodies of white attitudes towards blacks. One might argue some payback in this for centuries of offensive black caricatures, but the fact remains that, just as with black stereotypes, it doesn't help the drama: what is there to reconcile when the white characters are so one-dimensionally stupid? This highlights a major problem with the text, which otherwise is rich with both wit and feeling (especially in the fantastically punning speeches that Dingo as Old Toss delivers with such superb showmanship). When the script drifts into didacticism its energy flags, and this happens frequently in the second act: there are moments when you quite literally see actors step out of character and become declarative mouth-pieces. It's a shame, because this is otherwise powerful theatre, and Milroy's songs, which range from classic blues to growling contemporary Nick-Cave-esque ballads, are showstopping examples of the art. Enoch gives the play a seamlessly slick production, capitalising on its vaudevillean energy and Jacob Nash's cosily intimate design, and it's performed with energy and commitment by a first class cast. It seems unfair to pick out particular performances, because each cast member has his or her moment, but Yovich's Elsa is a winner, both as singer and performer, her power and allure riven by vulnerability and bitterness, and Tim Solly as Jack has a couple of devastating solo moments in a difficult part that often threatens to dwindle into cliche. Dingo is in his element as jester, and has many of the best lines: and it's in these moments that Milroy's satirical message finds its real teeth. My Bicycle Loves You is another Australian production, this time from physical theatre company Legs On The Wall, which was recently revamped under the direction of Patrick Nolan. To my shame, this is the first Legs On The Wall production I've seen; but it is a good introduction. 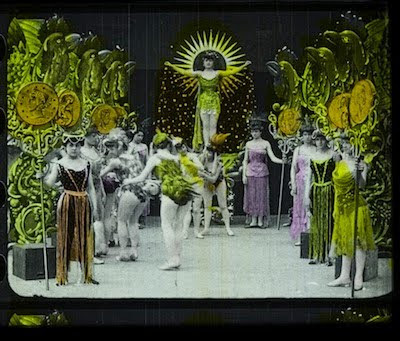 My Bicycle Loves You is a knockabout theatrical ride through some of the crazier excesses of The Corrick Collection, 135 films produced by the Corrick family in the early 20th century that are now preserved in the National Film and Sound Archive. The conceit is that the action follows "a day in the life of seven characters, all of whom live in the same apartment block". We see them first as if we were voyeurs from the street, peering in through the windows: then, gradually, they emerge, as if stepping out of a screen, and begin to play. Nolan exploits the remarkable and often bizarre Corrick archive as counterpoint and inspiration to the action on stage. A series of antics exploiting various stunts - hat tricks, balancing acts, slapstick fights, aerial acts - come into theatrical play with the projected images. The stage (in a flexible and deceptively simple concept by Anna Tregloan) is a space of constantly changing planes and perspectives: the eye is drawn from the present to the past, from filmed image to live performer, until each becomes inextricably tangled with the other. There are moments of fabulous comic ingenuity: at one point Laasko the hat designer is looking for his wife, whom we see standing in the distance: he takes a drawer out of his desk and looks at it lovingly, turning it to the audience, and her projected image appears in the drawer, then on his chest, then serially on the desk as he turns it over looking for her, until at last the performer herself is revealed on top of the desk. My Bicycle Loves You is a confection of image and sound (from an excellent band playing live in front of the stage) that at its best is enchanting. The program claims that it's an exercise in story-telling, which seems to me a bit of a misnomer. The only stories that were really clear on stage were those on film: an astonishing reel from the Corricks, for example, in which a magician in what seems to be mediaeval Venice is burgled by two thieves who steal his invisibility potion, with slapstick results. For the most part, it's a series of episodic acts, loosely linked by image and character rather than any pretence at narrative, which doesn't sustain the length of the show. Perhaps part of the problem here is that an expectation of story-telling is set up, without being delivered. Sometimes the acts lack the virtuosity that makes impossible feats seem effortless, generating an anxiety for the performer, although this roughness can in fact be a virtue, part of a shambolic and peculiarly Australian charm. However, little on stage rivals the sheer craziness of some of those films. There is a recurring comedy in which a man grows enormous horns and runs about the town attempting to gore innocent bystanders: when this is translated to physical theatre, it somehow loses its surreality. I have always sworn that theatre is more poetic medium than film, but maybe I have to rethink that prejudice. All in all, well worth a look. Pictures: Top: Waltzing the Wilarra; bottom, a still from the Corrick archive that inspired My Bicycle Loves You. * Alison Croggon travelled to Perth as a guest of the Perth International Arts Festival. Waltzing the Wilarra, by David Milroy, directed by Wesley Enoch. Music director Wayne Freer, set design by Jacob Nash, costumes by Isaac Lummis, lighting design by Trent Suidgeest, sound design by Kingsley Reeve, choreography by Claudia Alessi. With Ernie Dingo, Jessica Clarke, Kelton Pell, Irma Woods, Ursula Yovich, Trevor Jamieson, Tim Solly and Alexandra Jones. Musicians: Ric Eastman, Wayne Freer, David Milroy, Lucky Oceans and Bob Patient. 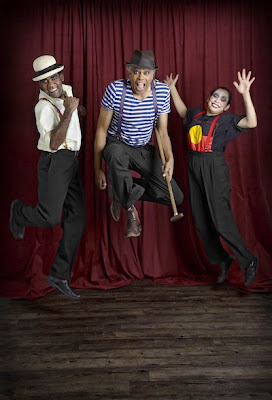 Yirra Yaakin Theatre Company, Subiaco Arts Centre, until March 6. My Bicycle Loves You, devised by Beatrix Christian, Patrick Nolan, Anna Tregloan and company. Directed by Patrick Nolan, composer Ben Walsh, designer Anna Tregloan, video artist Mic Gruchy, lighting Damien Cooper. With Alicia Battestini, Tom Flanagan, Alexandra Harrison, Aimee Horne, Kate Sherman, Matt Wilson and Emil Wolk. Musicians: Eden Ottingen, Matt Ottingen, Daniel Pilner and Mich Stuart. Legs on the Wall, Regal Theatre, until February 26.